The Forum of Private Business has been giving support, advice and protection to businesses owners of small, medium and large organisations for over 40 years and we now represent thousands of private and family-owned companies. Since the introduction of our first published edition "Employment Manual" back in 1999, business regulations, legislation and the way business is conducted, has changed dramatically. For many years the Forum has produced two main guides, the Health and Safety Guide and Employment Guide, updated yearly and supported by our legal expenses insurance policy along with our member helpline. The Forum is proud of the guides and we continue to add further essential guides to the collection. We believe that the guides are important for any business owner to refer to, giving up to date, jargon-free referencing. 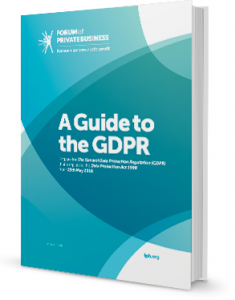 The Forum GDPR guide in the latest addition to the Forum’s collection of guides and is available in a digital format to all members and non-members. Printed copies are available to purchase from the Forum also. The new EU General Data Protection Regulation (GDPR) is the most important change in data privacy regulation for 20 years and will apply to all businesses from Friday 25th May 2018. 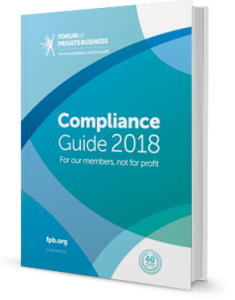 The Forum Compliance Guide is currently a digital-only produced guide available to all members as of September 2017 as part of a Forum Membership and is available through the members portal. Compliance means conforming to a rule, such as a specification, policy, standard or law. Regulatory compliance describes the goal that organisations aspire to achieve in their efforts to ensure that they are aware of and take steps to comply with relevant laws, policies, and regulations. 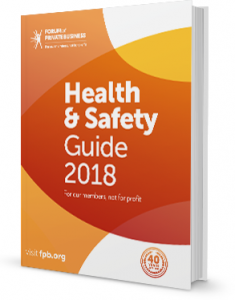 As an employer, you are responsible for managing health and safety in your business and you need to ensure you are providing a safe working environment for employees, contractors, visitors and anyone else who might be affected by your operations. All businesses need to be demonstrating an effective health and safety management system. The first edition was released in 1999 the Forum Employment Guide has grown both in the legislation and guidelines that are now in place with employment law along with the information we provide. 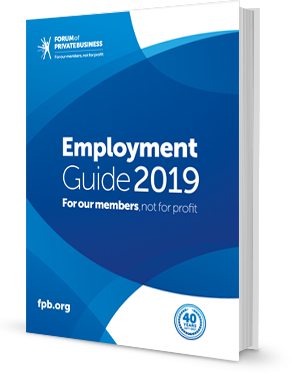 The Employment Guide is a printed yearly edition guide that is available to our members and has become a recognised HR resource that business owners cannot be without. First edition released in September 2016 with a continuous update being made to the guide for our Startup Membership. 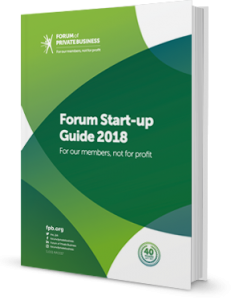 This guide is available as part of the Forum Startup Membership as a digital download and works through the process of starting a new business. What do you need to be doing, what you need to have in place to be successful and by using this guide you will be able to give your startup business a great start. The Forum believes that it is so important to support start-up businesses in the early years as statistics show that 90% can fail in the first 3 years of trading. As a member of the Forum, you can take the opportunity to undertake a full audit and achieve Responsible Business Standard certification. 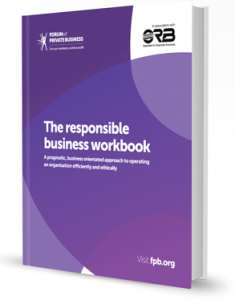 We have worked with our partner Organisation for Responsible Businesses to bring our members this guide. Forum Guides are an additional charge subject to Forum Membership subscription criteria. In order to download templates, you will need to be a member of the Forum of Private Business. To join us or if you have any further queries please contact our membership advisors on 01565 626001 or email. Full T&C's apply which can be found here.